The bouquets presented at the Olympic medal ceremonies are distinctive and suitably British. 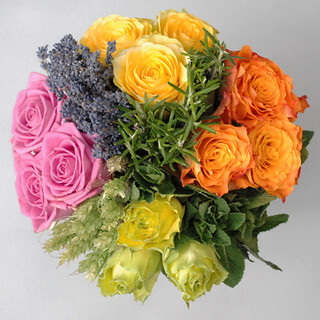 Designed by Susan Lapworth, the vibrant mix of roses and herbs comes from Jane Packer Flowers of London. Packer was a fashion leader in the world of florists and provided the flowers for the Duke of York and Sarah Ferguson’s wedding. She died in November of 2011, midway through the design process for the fashions and flowers of the 2012 Olympics. It was critical that the flowers in the bouquet not only reflected the host country but could also be grown there. Flowers had to be specially sourced from UK growers as there is no longer a commercial rose industry in the UK. The pink, yellow, orange, and green roses are separated by classic British food ingredients: lavender, rosemary, apple mint, and wheat. The quadrant layout of the roses is meant to reflect the (often derided) 2012 Olympic logo. Consideration was given to the sustainability and re-use of the packaging materials and plants. The 4,400 bouquets needed for medal-winning athletes are being prepared with the help of floristry students. The Olympic medals will last longer, but the accompanying flowers will add a lovely smell of victory. Pie jousting has spread to Burien! What’s pie jousting you ask? Every April 1st at Sully’s Snowgoose Saloon on Phinney Ave. in Seattle a jousting competition is held where competitors ride bicycles and throw cream pies at each other. It’s a lively spectator sport with delightful crowd reactions. Last week in Burien, which is south of Seattle, they held their own pie jousting tournament which included tricycle matches for the little kids. The event raised funds to purchase bike racks for downtown Burien. When visualizing how you might excel at pie jousting, keep in mind that you are riding a bike while holding a pie in one hand. And that your opponent is coming towards you doing the same thing. Here’s the Seattle Times video coverage. 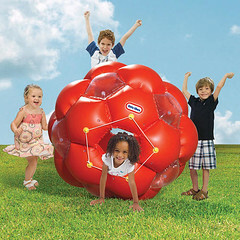 In one of those fateful coincidences, right after writing about the ZORB globe I went to a party where the kids were rolling around in a very similar, child-sized version. It’s made by Little Tikes but I can’t find it in their online catalog. Toys”R”Us has it listed with mixed customer reviews that, as might be expected, complain that it is difficult to inflate properly and can lose air. The kids at the party had a blast with it, even when they weren’t getting a turn inside, because they could help push it around without adult help and there was a large, flat lawn to roll around on. One of the transparent cells had lost air, but it didn’t seem to hamper the performance. The advertised weight limit is 150 pounds and we had kids jumping all over it, on top too. A potential problem could be when someone gets trapped inside if there’s too many people squishing them from the top, but we didn’t have unhappy kids, just a lot of delighted screams. If you search for news about “wiffle ball” you’ll find a healthy population of amateur league players who aren’t just hitting with the kids in the backyard. Several regional and small-town papers have stories about wiffle ball tournaments, usually put on as charity events. Wiffle Balls were first produced in 1953 in Shelton, Connecticut and the company is still there. The ball, perforated on one side, curves easily and doesn’t travel too far, saving pitching arms and making it ideal for street and yard games. The official rules state that a broom handle can be used if a Wiffle bat is not available. The picturesque scenery surrounding the Tour de France must help promote countryside tourism. The riders cycle past castles and quaint towns. What I love most are the old windmills. These elegant workhorses of the grain farms are each unique. Looking through the extremely comprehensive lists of windmills in Wikipedia, you realize that although Holland is the country most associated with windmills, they were an important fixture in most European countries. Even if you exclude the modern windpumps and turbines, the different rotation devices, sails, machinery, and construction materials make for a wide variety of windmill designs. There are 30 major league baseball parks and Darren O’Donnell plans to see them all in one season — on a bike. He started in Seattle after quitting his job as a Bellingham food co-op (they wouldn’t give him the time off) and he’s made it to Florida with 12 parks done. His father is sending letters to the teams’ front offices, inviting them to meet O’Donnell when he arrives. O’Donnell is tweeting and updating his Facebook page along the way. He expects to reach his final stop in St. Louis on September 25th and doesn’t plan to bike home. Last May, Seattle Mariners’ bullpen catcher Jason Phillips noticed a woman in the stands, decided to make a move if the game went into extra innings, and ended up tossing her a baseball with his phone number written on it. After the 15 inning game a text from Molly Ray was waiting on his phone. They soon went out to dinner and discovered they had a lot in common. 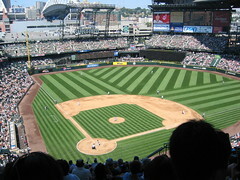 This Sunday they are getting married at Safeco Field after the 1pm game. Most ballpark weddings take place at home plate, but this one will be in the bullpen. And hopefully the couple won’t take it as a bad sign if the game goes into extra innings this time. In a presumably unintentional publicity stunt, a Seattle Seahawks player was caught by police entering a Top Pot Doughnuts at 3 am from a back entrance off a hallway in the building he lives in. He was given a warning by the police and his coach commiserated “I do understand the allure of the maple bars.” Oh, and by the way, Top Pot Doughnuts are now sold at Qwest Field during Seahawks and Sounders games. The Chicago Blackhawks, who seek to end their 49 year old Stanley Cup drought this week, were named after their first owner’s military unit, the 86th Infantry Division, nicknamed the Blackhawk Division. The division was named after Chief Black Hawk of the Sauk American Indian tribe. Black Hawk resisted U.S. settlement in Illinois and led his tribe in several conflicts against U.S. militia. The 1832 Black Hawk War bears his name and sealed his place as a tragic hero in Illinois and Wisconsin history. His name not only lives on in hockey but in businesses and schools all across the region where his followers fled from and fought against the population whose descendents revere his memory. The orange basketball rims on public courts in New York City stand up to a lot of abuse. Although other cities buy factory-made rims, the blacksmiths of New York’s parks department handcraft these sturdy steel rims. The design “has been kept in a dusty composition notebook in the center of the cavernous workshop.” Its origins are unknown but harken back to a time when everything possible was made locally instead of ordered from a national manufacturer.